It’s been in every tool belt since the 16th century. The claw hammer is a must-have for driving and removing nails and for small jobs requiring a little… persuasion. Claw hammers get their name from the notched extension behind the head, sometimes curved and sometimes straight, for pulling nails. They can be small and light, like the finish hammer, or long-handled and hefty like the framing hammer, but their accuracy and control comes from the head-to-handle balance. Over the years, the shanks have been re-designed for comfort using fiberglass, and graphite cores to lighten them up and absorb impact. 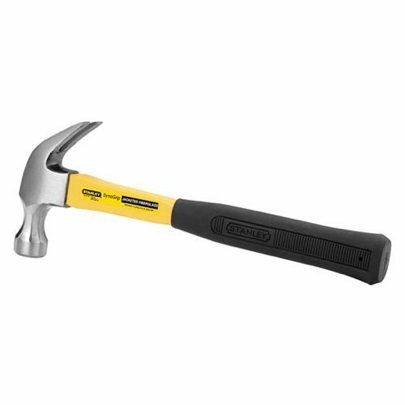 If you swing a hammer a lot, you’ll appreciate the shock absorbing power of a high-end titantium framing hammer. Titanium weighs forty-five percent less than steel, but it delivers the same driving power with ten times less recoil shock. That’s great news for your arm! After lots of use, a hammer head gets worn smooth and can start slipping off the nail heads as you work. Coarse sandpaper will dull down the striking surface to give you more traction and avoid some bruised thumbs!